Diafaan SMS Server - light edition - Send and receive SMS messages. Turn your GSM or 3G modem into a professional two-way SMS gateway. Use Microsoft Exchange Server or another email platform as a reliable SMS gateway. Send SMS messages from your email client and receive the replies and other incoming SMS messages in the right in-box. Save precious development time adding SMS or pager text messaging to your application. Diafaan SMS Server makes text message integration fast and easy. 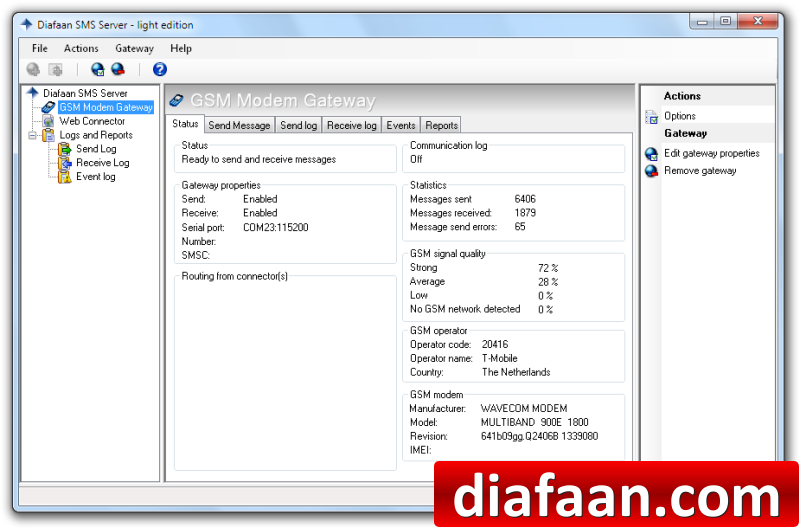 Diafaan SMS Server - light edition supports one GSM/GPRS/3G modem or Clickatell SMS account and one web server, e-mail server, SQL database or C#/Visual Basic .NET script.